“In an effort to better study a promising class of materials that could energize the solar cell industry, researchers at Lawrence Berkeley National Laboratory (Berkeley Lab) have developed a new method of analyzing the material’s molecular-scale structure. 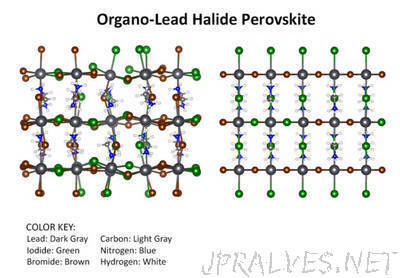 By combining advanced X-ray spectroscopy measurements with calculations based on fundamental “first principles” theory, researchers obtained an atomic-scale view of organo-lead halide perovskites not easily achieved with current technology. The approach they are taking works well with structurally disordered materials like halide perovskites, which have garnered intense interest in the solar cell industry because of rapid increases in their photovoltaic efficiency over the past few years. Understanding the structure of perovskites will help researchers determine how to maximize the material’s solar efficiency. Halides, such as iodide or bromide, are mixed at different ratios to tune properties in the material, like band gaps, that determine solar absorption efficiency. But doing so creates disorder in the structure, making it difficult to use traditional imaging methods. The researchers used an advanced X-ray spectroscopic technique at the Stanford Synchrotron Radiation Lightsource (SSRL) at DOE’s SLAC National Accelerator Laboratory. They coupled their results with theory work conducted at Berkeley Lab’s Molecular Foundry, where they interpreted the data to understand the structural details of the materials. Science. The Molecular Foundry and SSRL are DOE Office of Science User Facilities.